At Deep Ellum in Allston, bartender Emily Stanley is pouring absinthe, something that until recently she would not have been able to do without breaking the law. She prepares the spirit in the traditional way, setting a special slotted absinthe spoon over a glass, then placing a sugar cube on the spoon. Then she departs from tradition: She drips the anise-flavored drink, a brand called Lucid, over the sugar and sets the cube on fire. Absinthe traditionalists would cringe - why obscure the flavor of good absinthe with burned sugar? - but it does make for a nice piece of theater. And then it's back to tradition. She slowly pours cold water over what's left of the sugar cube; as the water trickles into the glass, the green-tinted spirit turns cloudy - an effect known in absinthe-speak as the "louche." "It won't make you see purple monkeys or anything," Stanley says. "But it will make you feel like a rock star." Absinthe has been effectively banned in the US since 1912, but its reputation precedes it: It inspires visions, it drives you crazy; it makes you paint masterpieces, it makes you kill people - so the stories go. It's said to have been created in the late 1700s by one Dr. Pierre Ordinaire as a tonic, made from wormwood and other herbs. Nicknamed "la Fee Verte" (the green fairy), it went on to become a favorite tipple of fin de siecle France, featured in the works of Picasso, Degas, Manet, Toulouse-Lautrec, and Van Gogh. They drank it frequently, as did poets Rimbaud, Baudelaire, and Ver laine. Hemingway and his characters also famously imbibed; Johnny Depp and Marilyn Manson are known for appreciating absinthe. (Manson has even launched his own brand, called Mansinthe.) It can be served with the ritual sugar and water, but also in cocktails such as the Sazerac, the Corpse Reviver No. 2, and Death in the Afternoon. What makes this drink, which tastes like a very complex Luden's cough drop, the subject of such myth and controversy? It's a long story involving marketing, misunderstanding, the temperance movement, tests on guinea pigs, and the ineluctably romantic pairing of dissolution and creative genius. (For more information, try the websites oxygenee.com and feeverte.net.) But the short version of the story centers around a substance called thujone. Found in the grand wormwood (Artemisia absinthium) used to make absinthe, thujone was said to be hallucinogenic and/or harmful; it's why there's been a de facto ban on absinthe all these years. Those in search of the drink's herbal flavor long had to content themselves with Absente, a liqueur made with Southern wormwood, or illegal (and often poor quality) absinthe smuggled in by travelers from Europe. Earlier this year, however, two absinthes made with grand wormwood, Lucid and another called Kubler, were allowed onto the US market; they began arriving in Boston bars and liquor stores about a month ago. What makes them legal? At the time of the ban, says Art Resnick, a spokesman for the Alcohol and Tobacco Tax and Trade Bureau (TTB), "the testing method that was used by the FDA, which is the recognized testing method in their regulations, couldn't recognize thujone at less than 10 parts per million. If it's not detectable under their methods, they as a practical matter consider it thujone-free." Lucid and Kubler come in under the legal limit. Attorney Robert C. Lehrman, who headed the fight to get Kubler on the market, began working on the issue in 2003. The TTB refused to let the company use the term "absinthe." Then, earlier this year, there was a change. "They surprised us by saying 'We are not going to let you use that term in any big way,' " he says. "It was a gigantic shift. We were suddenly arguing about size and placement, not whether it was OK to use that term. Approval followed from there. The law never changed." 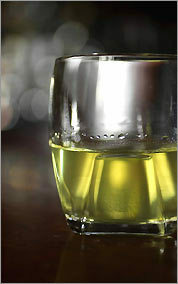 Deep Ellum was one of the first local establishments to pour absinthe. And thus I am at the bar to find out if Oscar Wilde was right when he said of his favorite potable: "After the first glass, you see things as you wish they were. After the second, you see them as they are not. Finally you see things as they really are, and that is the most horrible thing in the world." Glass No. 1: At first sip, the predominant taste is anise. Then other herbal notes start to kick in. It's slightly bitter, sort of like black licorice meets Campari. But much stronger. Lucid, the brand Deep Ellum is pouring, contains 62 percent alcohol to Campari's 24 percent, not to mention vodka's 40 percent. How many glasses are we drinking here, Oscar? I'm not sure I'm seeing things as I wish they were, but people do seem unusually friendly. Bartender Stanley joins me for a round; she drinks her absinthe in one shot (rock star). "Ready for another?" she asks. Glass No. 2: Absinthe seems to make me unusually clearheaded, an effect I'd heard about but didn't believe. I've had two now, and I'm barely feeling the alcohol. But maybe I'm just seeing things as they are not. Glass No. 3: The couple across the bar from me are trying absinthe. They sip, then grimace; I don't think they like it. My head hurts. I see things as they really are: I am not a rock star. But I'm OK with that. It's time to go home. There have been no hallucinations, no scrawled sonnets of unparalleled beauty, no murderous urges. I do feel oddly amped, though. All night I have extremely lucid dreams (guess that explains the name) involving detailed but mundane conversations with people I haven't spoken to in years. In the morning I find I'm wearing different pajamas than the ones I went to bed in. A drinking companion tells me he made a snack when he got home but realized when he woke up that he'd never eaten it. Was this thujone at work? More likely it was alcohol. "The whole thujone thing is ridiculous," says T.A. Breaux, the man who created Lucid, along with other absinthes. Breaux knows perhaps more than anyone else alive about making the spirit - his quest to distill historically accurate absinthe was chronicled in The New Yorker and Wired, among other publications. "The theory that absinthe causes hallucinations was just exaggerated. There was no absinthe around, so people speculated. I've tested absinthes from the 1800s. Vintage absinthe contained about 10 percent of the thujone that was originally theorized. Vintage absinthes could be called low thujone - they were." Dirk Lachenmeier, a scientist at the German food surveillance laboratory CVUA Karlsruhe, has studied absinthe extensively and concurs with Breaux. "To my knowledge, a hallucinogenic potential . . . was never proven for thujone in any concentration," he says via e-mail. "The only proven effects are seizures (like epileptic fits) if thujone is ingested in high concentrations (unreachable with absinthe). The limits are certainly justified to prevent potentially toxic thujone concentrations from reaching the food chain. The main human exposure for thujone is not absinthe but sage-derived products (sage filling in turkeys, etc.)." Lachenmeier's explanation for absinthe's popularity with all those artists and writers is ineluctably unromantic. "It was the psychotropic drug (due to ethanol, of course) with the highest availability and lowest price in this time frame," he says. In other words, it was Belle Epoque Thunderbird. "I presume that Van Gogh, Degas, and consorts would have been equally excellent artists if they had drunk nothing or other beverages like wine, gin, or vodka." Or simply had seconds at Thanksgiving dinner. But what about my feelings of clearheadedness? Did I imagine them? John Gertsen, the principal bartender at No. 9 Park, thinks that's possible. "There are many powerful things that happen when we start telling ourselves something's about to happen," he says. "Our bodies are capable of doing those things. The whole absinthe ritual maybe fools some people that they're about to fall into a state." The ritual at No. 9 Park is indeed seductive. Here, you can administer your own ice water from a tall glass absinthe fountain with four spigots. Chef Barbara Lynch found it at a flea market, and it's even more attention-getting than flaming sugar. Interest in absinthe has been high since the drink became available, Gertsen says: About 20 percent of the customers have asked about it. At No. 9 Park I drink just one glass, this time Kubler, a blanche, or clear, absinthe. The flavor is milder and less complex than Lucid's, with a lingering astringency on the back of the tongue. Again I feel incredibly alert. Breaux says he has experienced the sensation, too. "Red wine makes me feel different from white wine. Tequila makes me feel different from vodka. Absinthe makes you feel a certain way. It gives me the feeling of a heightened sense of clarity that lasts for a while." But ultimately, as with any spirit, drinking absinthe is about enjoying the taste, smell, and texture of a spirit, not necessarily its effects. "When you brush the myths aside," Breaux says, "absinthe is a beautiful artisanal spirit and a unique spirit, and one that deserves to be treated with respect."